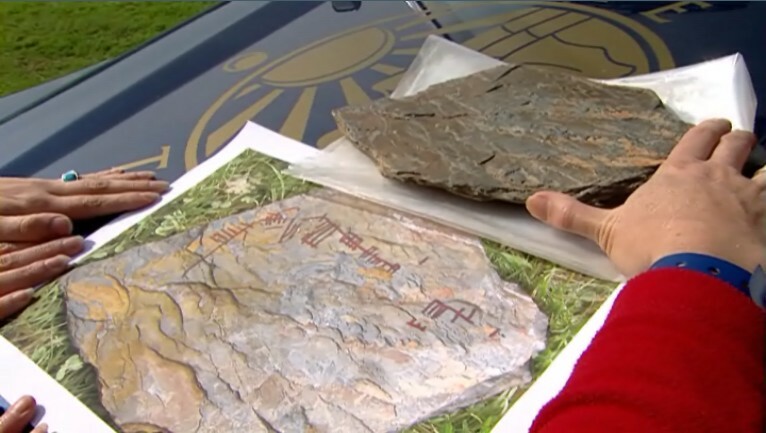 The discovery of an Ogham stone during an episode of the cult British archaeology programme, Time Team, is something that I have been longing to blog about ever since I saw the first broadcast on January 14th last year. But the only images of the stone and its inscription available on the Time Team website are pitifully small and utterly useless, so I was unable to do anything meaningful ... that is, until the programme was repeated last week, and thanks to 4oD (Channel 4's TV and Film on Demand service) on Monday I was able to download the programme to my computer and take some good quality screen shots of the stone and its inscription. 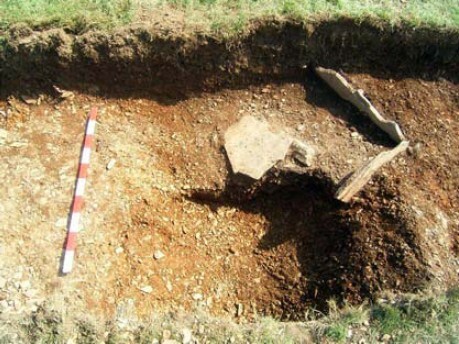 The Ogham stone in question is a smallish slate slab (about 32cm × 20cm in size) that was found within the subsoil near a grave in Trench 2 of the Time Team excavation at the Speke Farm keeill (chapel) by the seventh fairway of the Mount Murray golf course five miles southwest of Douglas in the south of the Isle of Man during three days in September 2006. The keeill was built in about the early 11th century on the site of a Christian cemetery (with burials dating from as early as the late 6th century), which itself was on the site of a bronze age burial ground. The Ogham stone and other artefacts from the dig were donated to Manx National Heritage, and since July 2007 have been on display at the Viking & Medieval Galleries at the Manx Museum in Douglas. 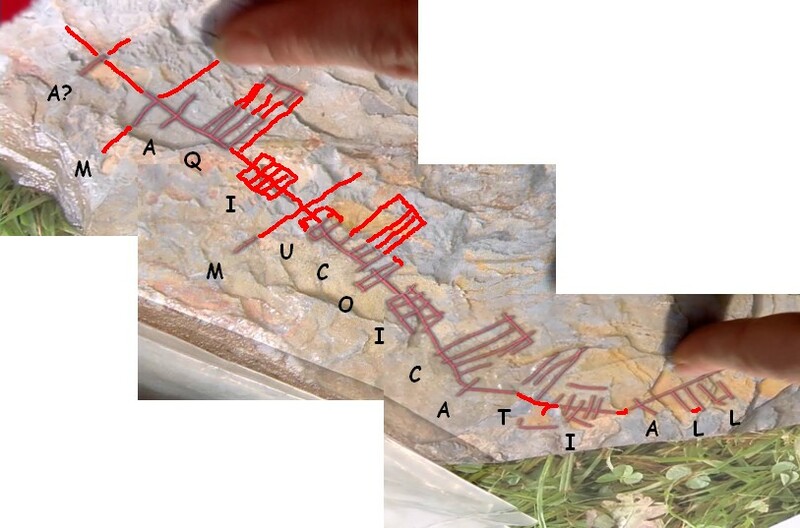 Because the "letters" formed by these groups of lines are geometrical, and so can be interpretted as letters whichever way up you look at them, it is often not easy to be sure what the orientation of the writing is, especially in the case of inscriptions on flat surfaces (as opposed to the classic Ogham inscriptions that go up and down the arris of a monumental stone). If you look at an inscription one way lines branching up from the stemline appear to be the letters H/D/T/C/Q, but if you rotate the inscription 180° the same lines now appear to be the letters B/L/F/S/N..
Secondly, although Ogham letters written in medieval manuscripts are usually quite clearly distinguished, it is another matter entirely when the letters are scratched onto a stone. Because the lines of Ogham letters on inscriptions on stone or bone are often irregularly lengthed and oriented the M/G/NG/Z/R and A/O/U/E/I series of letters can be easily confused. And then because of irregular spacing within groups of lines forming a letter as well as between different groups of lines, it can be difficult to be sure whether an irregularly spaced sequence of lines constitutes a single letter or two or more separate letters. 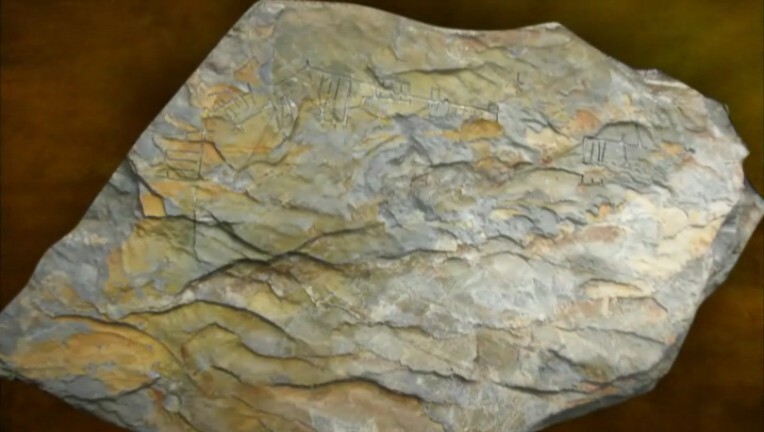 Thirdly, weathering and damage to the stone on which an inscription is made can cause damage to or loss of individual letters or whole sections of the inscription. For example, damage can cause one side of a line that originally intersected the stemline to be obliterated, with result that it appears to be a letter from a different series; and if one line of a group of lines is lost then it would appear to be a different letter. Finally, even if you do get hold of an unweathered inscription neatly inscribed with clear and unambiguous Ogham letters, you are still left with the task of actually reading and making sense of the inscription. Classic Ogham inscriptions are written in Primitive or Old Irish, but later inscriptions may be in either Middle Irish or some other language—many of the Scottish Ogham inscriptions are in an undeciphered language that may be Pictish. And even if you know what language the inscription is in, as there is usually no separation between words in an Ogham inscription, the reader has to take the raw string of letters and divide them into lexical units themself in order to comprehend the sense of the inscription. 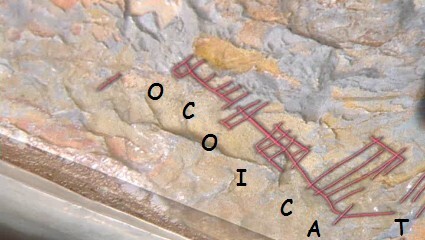 This task is made harder by the fact that the writers of Ogham inscriptions did not have dictionaries to guide their spelling, and futhermore Ogham orthography can differ subtly from the orthography used to write the same words in the Latin script (gemination of consonants is a common feature of Ogham orthography compared with Latin orthography). Bearing all this in mind, one can sympathise with Kate Forsyth of the University of Glasgow when Time Team demanded of her a translation by close of play on Day 3 of the Ogham inscription that they had unearthed on Day 2. I can only imagine the words of caution that Dr. Forsyth must have attached to her preliminary attempt to decipher the inscription, but any doubts that she may have had were swept away for the sake of reality archaeology by the bold assertion of the Time Team archaeologists that the inscription was in 11th century Gaelic, and that Dr. Forsyth was able to read the inscription and had a translation. With a triumphant flourish one of the archaeologists holds up the stone and carefully and knowledgeably points out that this word on the left is BAC meaning 'corner', and that this word in the middle is OCOICAT meaning 'fifty', and that this word on the right is IALL meaning 'group', 'gang', 'throng' or possibly 'throng of warriors'. The language of these words is Middle Irish, which was the ancestor of modern Irish, Scottish Gaelic and Manx. With the help of the electronic Dictionary of the Irish Language (the standard dictionary of Old and Middle Irish) we can see that bacc means 'angle', 'bend', 'corner'; coíca, coícad or coícat (in numerous variant spellings, but never with an initial vowel) means 'fifty'; and that íall is a word meaning 'thong', 'strap', 'leash', 'shoe-string' or 'caul', but with an extended meaning of 'flock', 'flight', 'birds', 'company', 'troop' or 'band' (a 'string' of birds = a flock). As the Time Team archaeologists were speaking to Dr. Forsyth over the phone, it seems that as well as getting the orientation of the inscription wrong, they also misheard 'thong' as 'throng' to get a 'throng of warriors'. The Time Team spin was that the inscription records an incident involving a band of fifty warriors (presumably fifty Irish warriors fighting against the marauding Vikings). I am really very sceptical about such an interpretation (although to be fair, Mick Aston also expressed some doubts about the inscription). If a battle between the original Irish inhabitants of the Isle of Man and the invading Vikings were to be commemorated then any memorial inscription would be on a large memorial stone or pillar (as so many Ogham inscriptions are), not on a small, unshaped stone slab that can be held in one hand. Nor does it seem likely that it marked the mass grave of fifty brave warriors killed in battle as they is no archaeological evidence of a mass grave where the stone was found. So I think that we can discount the possibility that this stone was a monument commemorating a battle or the death of fifty warriors. But if not a memorial to fifty warriors then what is it ? 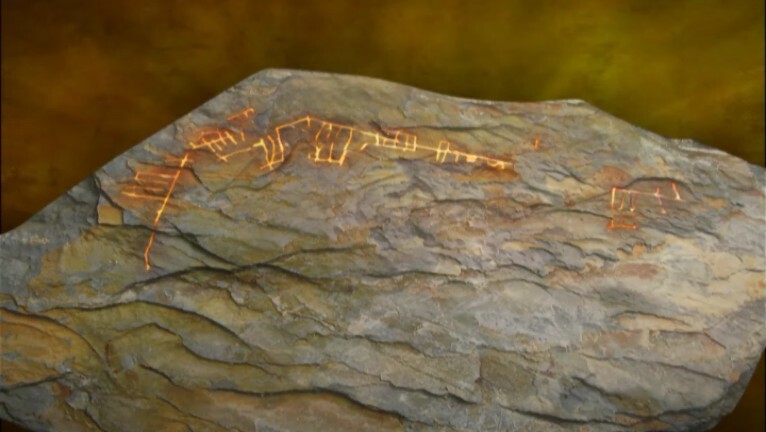 Well, the Ogham script was not normally used for inscribing random messages on stones, but was almost exclusively used for commemorating the dead or marking land ownership of the living. Of the other eight Ogham inscriptions known from the Isle of Man, six are in the form "X, son/grandson of Y", and the other two are simply the Ogham Abecedarium. I would be very surprised if the Time Team Ogham stone turned out to be an exception to the general rule that Ogham stone inscriptions rarely include anything more than the name of a person. As Time Team's Ogham stone was found next to a grave (unfortunately it is not clear what the age of the grave is) I think that the most likely explanation is that the stone was used as a grave marker, and its inscription indicated who the occupant of the grave was (see Addendum 2 for the dating of the grave). Several things stand out. Firstly the Ogham letters are not the type normally found on classic Ogham memorial stones, but are a form of letters known as "Bind Ogham", in which the strokes forming a single letter are bound together along their tips by a line parallel to the stemline. This makes the identification of individual letters somewhat easier, so, for example, the four strokes at the end of the inscription (at the far left of the above image) can be identified as two letters, LL, rather than a single letter, S, because the strokes are bound into two groups of two. 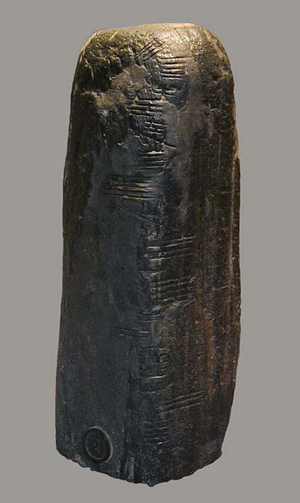 This form of Ogham writing is typical of later inscriptions, and together with the fact that the inscription is made on a flat surface using an artifical stemline, tends to corroborate the early 11th century date that the archaeological context apparently implies. Secondly, the stemline extends on the left hand side beyond the end of the inscription (you can also see this empty stemline extension clearly on this image of the raw stone). The most likely reason for this was that the writer of the inscription incised the stemline first, estimating how much space he would need, but in the end the inscription did not take up all of the space reserved by the stemline. The implication of this is that the inscription starts at the right hand side, and the empty stemline at the left hand side is at the end of the inscription. That is to say, the inscription reads left to right if we rotate the stone 180° (as Dr. Forsyth proposes). 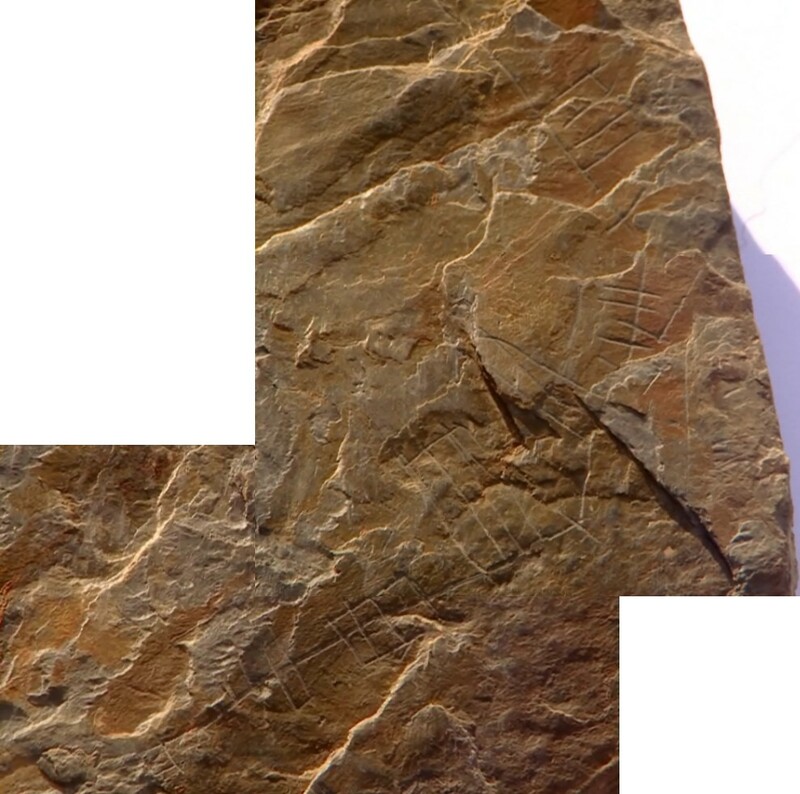 It should be noted that there are no other physical indications of directionality to rely on in this inscription (such as the presence of a feather mark at the start of the inscription; or the angle of the strokes of the B/L/F/S/N and H/D/T/C/Q series of letters, which in some inscriptions are written at an angle so that the tail-end of the strokes trail behind), so the only test of directionality is to try reading from both directions and seeing which makes most sense. If we do try to read the inscription the opposite way to Dr. Forsyth (i.e. from left to right in the above picture) we get DDAIFASIOSO SAH ᚇᚇᚐᚔᚃᚐᚄᚔᚑᚄᚑ ᚄᚐᚆ which does not make any immediate sense, so I think that directionality proposed by Dr. Forsyth is probably correct, and that the proposed reading of BAC OCOICATIALL ᚁᚐᚉ ᚑᚉᚑᚔᚉᚐᚈᚔᚐᚂᚂ is more likely. But the question now is how to divide this up into individual words ? Dr. Forsyth sees the word COICAT 'fifty', but is this what was meant by the writer, or just coincidence ? Are there other ways of dividing up the inscription that makes sense ? In particular, is there a personal name hidden amongst these letters ? Well, by far the most common element in Ogham inscriptions is MAQI 'son of' (the Mac of MacDonald). Although at first glance this does not seem to occur in the inscription, I think that with a little imaginative reconstruction (the essential tool of an epigrapher) we can in fact see this word. 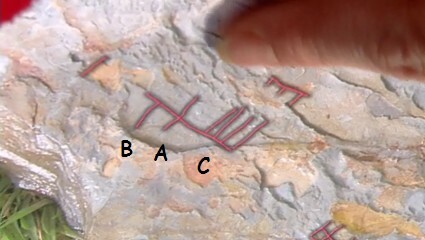 If we look at BAC it is not hard to imagine that the letter B ᚁ is a damaged letter M ᚋ (stroke above the stemline obliterated), that the letter C ᚉ is a damaged letter Q ᚊ (final stroke of the letter missing), and that the gap between BAC and OCOICAT was originally filled by the letter I ᚔ (just about a perfect fit for the gap). The inscription on this stone reads BIVAIDONASMAQIMUCOI CUNAVA[LI] ᚁᚔᚃᚐᚔᚇᚑᚅᚐᚄᚋᚐᚊᚔᚋᚒᚉᚑᚔ ᚉᚒᚅᚐᚃᚐ "Of Bivaidonas, son of the tribe Cunava[li]", where MUCOI means "of the tribe of". The formula X maqi mucoi Y "X son of the tribe of Y" is found on many other Ogham stones of the early period, including the famous Silchester Ogham Stone, which has the inscription TEBICATO[S] [MAQ]IMUCO[I] ... ᚈᚓᚁᚔᚉᚐᚈᚑᚄ ᚋᚐᚊᚔᚋᚒᚉᚑᚔ "Of Tebicatos, son of the tribe of ...". On the Time Team Ogham stone the O of OCOICAT is right on the edge of the damaged section of stone, and it seems to me quite possible that it is missing a stroke, which if it were the case would make the apparent letter O ᚑ actually the letter U ᚒ. Then, what about the stray stroke we see in front of OCOICAT ? I believe that it may be all that the remains of a letter M ᚋ between the missing I of MAQI and the reconstructed letter U, yielding MUCOI following the reconstructed MAQI. But if we are to read the first part of the inscription as MAQI MUCOI "son of the tribe of", then we need a personal name in front of it. And indeed there does appear to be an isolated stroke before the reconstructed MAQI that may be a letter A, and all that remains of the commemorated person's personal name. As to the tribal name CATIALL, other than the fact that it seems to be missing something at the end—the letter I probably, which would nicely fill the trailing stemline that we see after CATIALL—this seems to me like a very plausible tribal name (the name has resonances with the much earlier Catuvellauni of south-eastern Britain and the Catalauni of Belgic Gaul). There are perhaps a few too many ifs, buts and maybes for my reconstructed reading of the Time Team Ogham stone to be wholly convincing, but I feel in my bones that I am basically correct, and that a close examination of the stone in the hand may be able to confirm my reading. However, my reading does leave us with one last problem. The fact that the inscription is on a flat surface and uses bound letters suggests a late date, and Dr. Forsyth's reading suggests that it was written in Middle Irish and dates to around the 11th century. But my reading harks back to the Old Irish of the classic Ogham memorial stones, and would suggest a much earlier date, perhaps 6th to 8th century. My feeling is that the flat surface inscription and artificial stemline are not conclusive proof of a late date (the Silchester Stone has an artificial stemline on a flat surface, and it is dated to the 4th or 5th century), and that it is quite possible that bound letters developed earlier than is currently thought, so I do not think that it is impossible that the stone could date to the pre-Viking period of Manx history. I think that the solution to this riddle must lie in the dating of the grave next to which the Ogham stone was found. If this grave dates to the late 6th century, which is the date that carbon dating suggests for the grave of a woman with a preserved knot of plaited hair, then I think my reading is vindicated; but if, on the other hand, the grave proves to be contemporary with the construction of the keeill (i.e. late 10th or early 11th century), my reading is more problematic (see Addendum 2 for the answer to the riddle). Reader Liwtydd kindly went to the Manx Museum, and made the following sketch of the inscription based on his examination of the actual stone. This photo shows the south-west corner of the cist grave, with its north side cut away by a later ditch. The Ogham stone would have been found to the left of the measuring rod. The report states that the Ogham stone was found in the subsoil to the north of an east-west aligned cist grave (#213). The stone lining on the north side of the grave had been cut away by the digging of a later ditch. Skeletal remains of a young adult (#215), about 14–20 years of age, were found in the grave, and a fragment of skull was sent for radiocarbon dating, specifically in order to determine whether the grave was contemporaneous with the Ogham stone or not. The radiocarbon dating obtained was 1470±30 years BP, which gives a calibrated date of AD 540–650. However, as Dr. Kate Forsyth dated the stone to the 10th or 11th century (potentially 8th to 12th century) on the basis of the late features of the inscription (bind oghams on a flat surface) and its supposed Middle Irish language, the Time Team archaeologists discounted any association between the stone and the grave. Forsyth concludes that the supposed Middle Irish inscription (BAC OCOICAT IALL = "corner/angle", "fifty", "throng/group") was not a formal inscription but perhaps "idle doodling or graffiti". I think that this conclusion is a mistake, and that the association of the stone with the grave should not have been so lightly dismissed. Although the artifical stemline carved on the flat surface of a stone and the use of bind oghams do suggest a relatively late date for the carving of the inscription (compared with the 5th or 6th century date for typical Ogham pillar stones), these features are also found on Pictish Ogham stones, and are still consistent with a 6th through 10th century date. 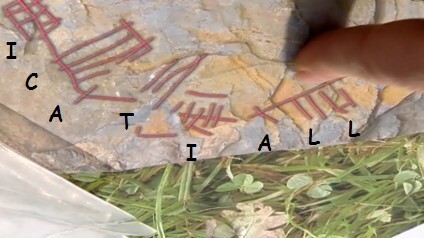 My interpretation of the the inscription as a conventional memorial formula in Primitive Irish (X MACI MUCOI Y = "X, son of the tribe of Y") makes a 10th or 11th century date highly unlikely, although the form maci for earlier maqi is indicative of a later date than the typical 5th and 6th century Ogham pillar stones. Thus both the physical form of the inscription and its linguistic features are, in my opinion, indicative of a date several centuries earlier than Forsyth's suggested 10th or 11th century date, and I would suggest a date range of late 6th century through 9th century, which does indeed fit in with the radiocarbon dating for the nearby grave of 540–650. As a memorial inscription (rather than idle doodling) the Ogham stone would be expected to have been associated with a grave, and as it was found to the north of a cist grave that had been severely disturbed on its north side, it seems to me an inescapable conclusion that the stone was indeed associated with this grave, and that the inscription commemorates the young occupant of the grave. Thus we can date the inscription to circa 540–650 per the radiocarbon dating, which is nicely within my original estimate of 6th to 8th century.